Israel‘s first attempt at landing an unmanned spacecraft on the Moon today ended in a hard landing after an engine failure caused it to miss its descent window. While it’s unfortunate the craft’s journey ended abruptly, the mission should be lauded as a total success. The craft, named Beresheet (translated: in the beginning), was slated to touch down on the surface of the Moon at approximately 3:25 PM PST, but communications with the vessel were lost upon impact. The Israeli Aerospace Industry’s space division and SpaceIL, the non-profit that sent the craft into space, are currently indicating they presume it to be damaged beyond further function. Whenever an organization takes on a monumentally difficult project that seems to test the limits of plausibility, in the tech world, it’s referred to as a moonshot. 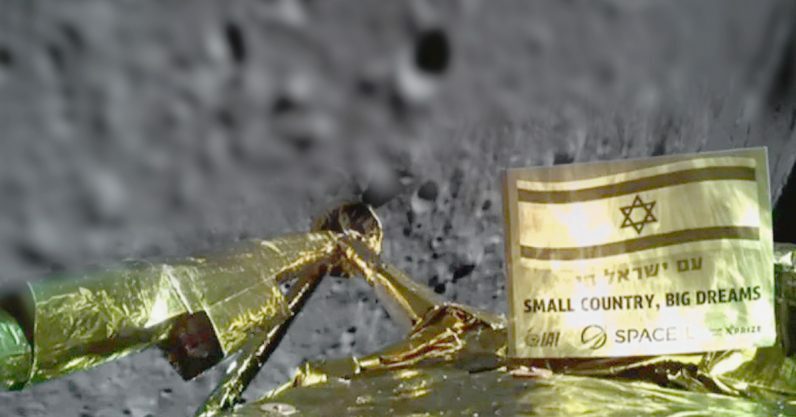 SpaceIL’s attempt at landing Beresheet on the moon today is exactly why. The sheer enormity of the undertaking makes it seem impossible, but thanks to some amazing rocket science, Israel has joined the short list of nations that have so much as sent a craft into the Moon‘s orbit. Only three – The US, Russia, and China – have successfully completed a soft-landing. Israel‘s first attempt fell short because the craft’s engine — essentially the brakes of the vehicle in this situation — cut out and stopped it from slowing itself down. Unable to stop, it smashed into the Moon‘s gray dirt — its mission ended. But, the root cause of why Beresheet crashed isn’t as cut-and-dry as engine failure. It was actually a long-shot among moonshots from its very inception. The project cost a measly $100 million. By comparison the Apollo Program would have figured at around $80 billion by today’s rates. And, most importantly, it failed to land because its mission was never about actually landing on the Moon anyway. The team who built Beresheet designed it as an autonomous landing craft – a lofty achievement in and of itself. It was then launched on the back of a SpaceX rocket where it orbited the Earth over and over, using the planet’s gravity to accelerate the craft and the rocket’s propulsion system to steer it away from the atmosphere in short, controlled bursts. Eventually the craft was snagged by the Moon‘s gravity and began its long descent to the surface. Upon finally reaching the Moon‘s surface (albeit at higher velocity than intended) it had traveled four million miles – officially having taken the longest route of any craft to ever visit the lunar surface. The trip itself was why the craft was created. And completing the journey proves there’s more than one way to throw a chunk of metal at the Moon. According to a report from Space.com, the team never intended Beresheet to be a science craft, but instead its mission involved “advancing Israel‘s space program, increasing the nation’s technological knowhow and getting young people more interested in science, technology, engineering and math.” To that end, Beresheet would have spent a few days conducting measurements and studies to aid future landing attempts. Otherwise the journey was far more important than the destination ever was. Not every crash is a failure. Team members who worked on Beresheet’s moonshot reportedly interacted with more than one million school children during their efforts to kindle interest in Israel‘s space program and, hopefully, inspire the next generation of scientists, technologists, engineers, and mathematicians. In the meantime, the team was still awarded an X-Prize bonus for the attempt, despite its mission being cut short. SpaceIL spokespeople say the team is eager to get started on Beresheet 2.0. Considering it nearly pulled off the miraculous feat of soft-landing a craft on the Moon — on such a small budget — there’s every reason to believe the next chapter in Israel‘s space program will be even more exciting.